Like anorexia, bulimia (full name bulimia nervosa) is a dangerous eating disorder characterised by repeated episodes of overeating and an intense fear of weight gain. Bulimia means ‘hunger of an ox’ and relates to the large amounts sufferers consume. This binge-eating is followed by an equally compelling need to purge all that food from their bodies. A binge-purge cycle will frequently interrupt a long-term diet and is usually triggered by emotional stress. Purging methods vary from self-induced vomiting to the use of various medications; they include laxatives, medications that make you vomit (emetics), medications that take fluids from your body (diuretics) as well as enemas and diet pills. All these methods are potentially harmful. The hunger of a bulimic is almost always driven by his or her emotions, a binge giving an initial ‘rush’ or a feeling of letting go of pressures and problems. However, binging and purging may make a person feel quite out of control. 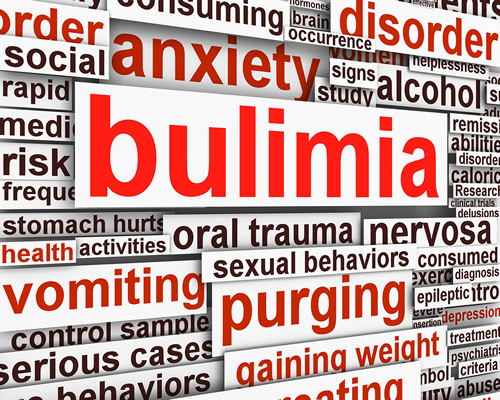 Bulimia may also result in out of control behaviour in other areas, and can be linked with shoplifting, alcoholism, drug abuse or inappropriate sexual activity. The first vomit may occur almost by accident as a means of getting rid of the full feeling that is normal after eating a good meal, the subsequent emptiness can create a ‘high ’that becomes addictive. Someone who is addicted to binge-eating and purging may look outwardly ok to the observer, this is the reason many cases go unnoticed until health problems arise. People at risk of developing the ED (Eating Disorder) are low in confidence, unassertive, have a poor body image and experience low self-esteem.